For almost five years, Debbie Trombetta’s life was defined by pain. She was diagnosed with fibromyalgia in 2000, a chronic disease whose symptoms include widespread pain, fatigue and weakness. Debbie had to rely on medications to get her through each day. Even then, she remained in pain, and the medications themselves were debilitating. By 2005, things had reached a breaking point. Debbie was being treated in the Emergency Department at Samaritan for migraine pain – her third visit in about a month – when a staff member suggested that she try the Interventional Pain Management Center at Samaritan to see if she could get any relief. It was a suggestion that changed her life. Debbie’s physician was Dr. Ivan Montalvo, an anesthesiologist who is fellowship trained in Interventional Pain Management. Over the years, Debbie has had a variety of treatments at the Pain Management Center, including neck and back lumbar epidurals and trigger point injections. She’s also received help with managing her medications. When Debbie started as a patient at the Pain Management Center the list of her medications was almost three pages long. Today, she is taking only five – and two of those are vitamins. Words no woman ever wants to hear. This was the news that Theresa Getter received after her normal yearly mammogram at Woman to Woman in October 2012. 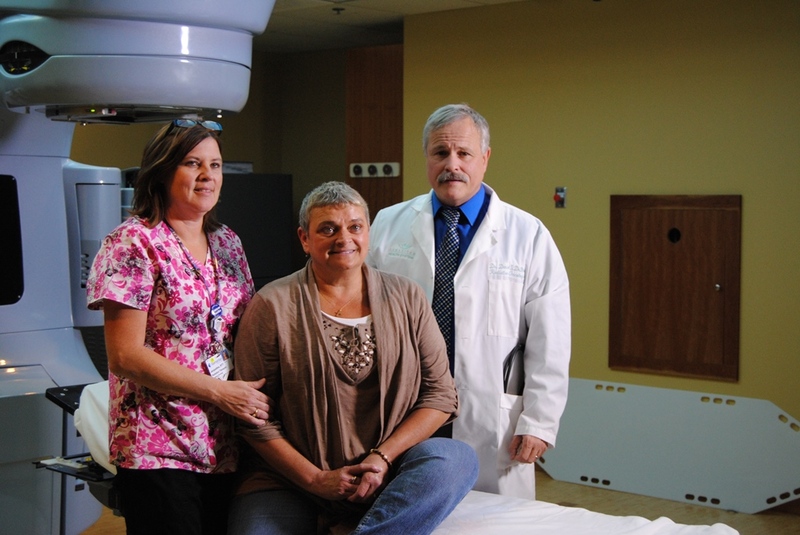 After a second mammogram and three biopsies, Theresa was diagnosed with Stage 2A breast cancer in her right breast. It was estimated that the tumor was two centimeters. After Watertown breast surgeon Dr. Deborah Norris gave Theresa her initial diagnosis of breast cancer, Theresa opted to go to Syracuse for a second opinion. After that office confirmed the diagnosis, Theresa then returned to Dr. Norris for treatment. Due to her strong family history of breast cancer (her mother and great aunt both had it), Theresa decided to have a double mastectomy and then breast reconstructive surgery in December 2012. Dr. Norris performed the mastectomy, with plastic surgeon Dr. Guillermo Quetell doing the breast reconstruction. After her surgery Theresa was told that a second, separate cancer was found in her left breast – one that had been undetected by her mammogram and other tests. The doctors also found that the lump in Theresa’s right breast was larger than initially estimated – five centimeters rather than two. Theresa’s journey has been a long one, but she recently received the very best of news. Her treatment is complete and she is cancer-free after her latest PET Scan. esa Getter received after her normal yearly mammogram at Woman to Woman in October 2012. “Our family would like to express our most sincere thanks for the outstanding care our father received during his recent and unexpected hospitalization. While visiting us from out of state he fell and hit his head. Given his age and how far he was from familiar doctors and caretakers, we were particularly concerned about the nature of the care he would receive at Samaritan Medical Center. In the two weeks of his stay, he was cared for in the emergency room, ICU, physical rehab, PCU, and the fourth floor; each department handled his treatment with the utmost respect and care. Even in his most precarious moments, every staff member talked to him to explain procedures, called him by name, and treated him as an individual. This was our first time at your facility and I was kinda nervous, my husband was having brain surgery, but everyone was great, ICU staff was tremendous and the service we received was great, can’t say anything bad at all, even the people I encountered getting on and off the elevator were very nice and spoke and said hi, so it was a good experience.